Why does the tortoises cross the road? If you see one, should you turn it around, or help it to cross? This past April, our teens asked (and learned the answer to) these and many other questions about animal tracking when they heard from National Geographic explorer, Dr. Stephen Blake of Washington University and the St. Louis Zoo. Dr. Blake has tracked gorillas and elephants in the Congo, giant tortoises and turtles in the Galapagos, and more recently, box turtles in Forest Park, St. Louis. In his presentation about animal tracking and conservation, he expanded upon his more recent exper iences with the tortoises of the Galapagos with a game focused on the movement patterns of foraging tortoises on three geographically different islands: Española, Alcedo, and Santa Cruz. In this activity, participants acted as tortoises, taking steps to a slow-paced drumbeat. They were required to work in pairs and, staying on their island (illustrated as the larger ovals in the image below), collect kernels of popcorn in a grassy area. 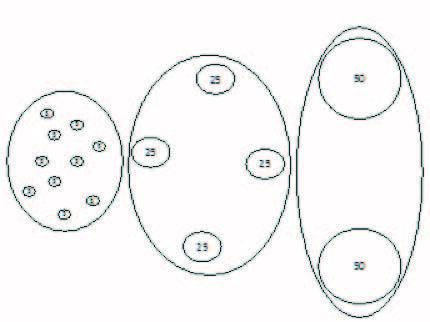 The kernels were available in concentrated food areas (demonstrated by the smaller circles), which were distributed differently based on the island that tortoises resided. After collecting five kernels, the “tortoises” had to move to a new food area. Participants continued this activity for five minutes. Afterward, each pair counted out the number of kernels that they ended up with. They averaged their number of kernels with other pairs from their island to generate a representative amount of food for the average tortoise. This data was compared with other islands, and participants formed conclusions relating the outcomes to the circumstances of their island. They also presented how they thought that this might connect to the islands in the Galapagos and the tortoises that forage there. For more information on the game and the islands, please refer to the attached activity plan and handout materials.